How to avoid scams and jams in Shangri-La! It is sometimes difficult to find accurate information about Nepal, and Westerners often feel a little lost the first few hours, days, even weeks, upon their arrival here. As a Westerner who lives here and is married into a Nepali family, I would love to share some things I now know that I wish I would have known on my first visit to Nepal. This is a fabulous country to visit and most people return again and again, but there are a few things that most have a little trouble with on the first visit. Here are some tips on getting transportation, avoiding scams and rip-offs, volunteering, and “fitting in”! Oct – Dec = good weather, sunny warm days, cool evenings — peak tourist season. Jan – Feb = sunny, but cool, off season so you can get good deals. Mar – May = good weather, tourist season, but not as busy as Fall. A pen to fill out the forms (there are none available in the airport). US dollars or convertible currency (15 days is $25; 30 days is $40; 90 days is $100). Address and contact of where you will be staying. After you pass through the immigration area, you will go downstairs to the baggage area. Clearing customs is straight forward, just put your luggage on the scanning belt. Nepal customs is like most other countries where drugs, firearms, plants, fruits, live animals, etc. are not allowed to enter the country. After you leave the customs, you will walk down a corridor that ends with a glass wall with hordes of drivers on the other side waving signs, and looking for their pick-ups. Just keep going out the door to the left, and if you do have someone picking you up, they will most likely see you there. If you need a taxi, keep reading, there are some things you need to know. There are plenty of taxi drivers waiting to take you to your destination, and an equal amount of young men ready to grab your bag and “help” you. A word of warning here: If you allow someone to help you with your bag, an appropriate tip is $1 or 100 NPR. They may try to say “Five dollars, or 10 dollars!” But that is WAY too much. (Keep in mind, tipping is not the “norm” in this country, so it’s not necessary for taxi drivers or waiters.) My advice is carry your own bags, and get used to saying “No thanks!” and keep walking. Taxis – There are small white taxis that can comfortably seat 3 people and hold your luggage in the trunk or roof. These should cost maximum of 500 – 600 rupees to/from the airport. The taxi drivers try to stick together on this, so if you can get one for 500 rupees to Thamel (main tourist district), or Kathmandu Center, then you are paying what everyone else does. There are also small taxi vans you can get, and they should cost only slightly more; 700 – 800 rupees would be a fair price for the van. The vans sometimes say they are charging “per person” but just say your final price is 800 rupees. 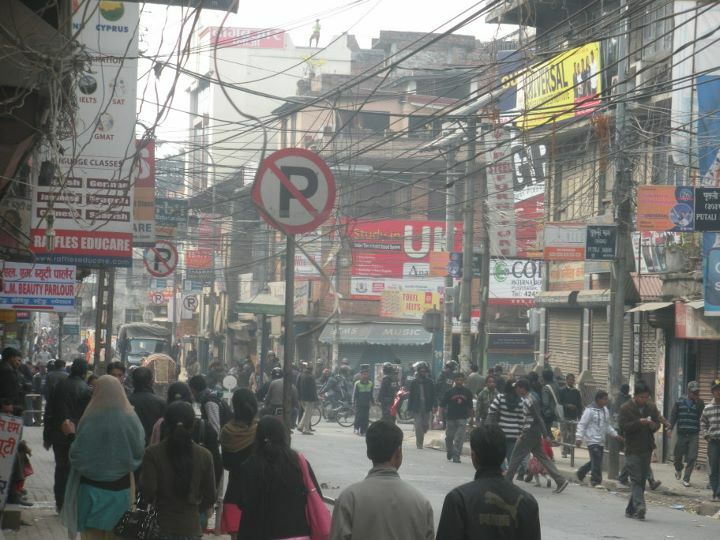 Other places; other modes –From other places in Kathmandu, a taxi should always cost 200-300 rupees maximum. If you pay more, you’re getting ripped off. The micros (small white mini-vans packed with people) are cheap, usually around 15-20 rupees to anywhere in the city, but they are sometimes full of people and very slow. Most westerners prefer taxis, unless they are on a strict budget and staying here a long time. Rickshaws are from 50-100 rupees to most places you would want to go with this mode of transportation. One hundred would be a bit high for a Rickshaw from say, Thamel to Durbar Square, but 70 rupees would be fair. Nepal’s Tourist Bus – Costs 750 rupees each way to Pokhara or Chitwan. 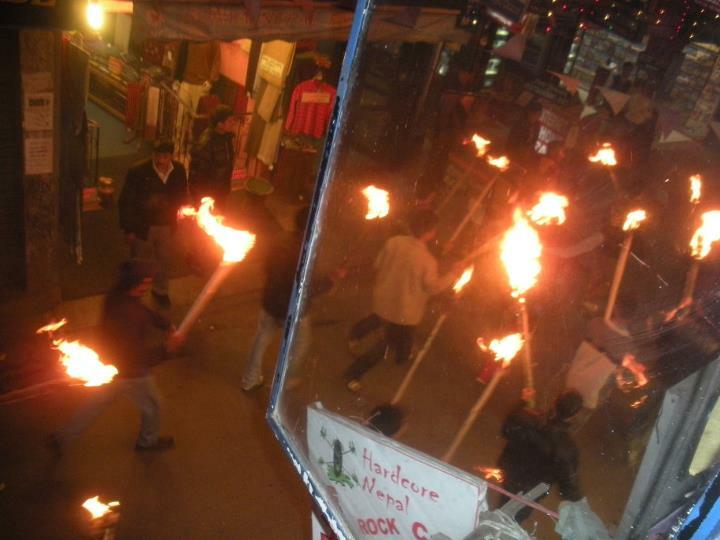 Any tour operator in Thamel will book this for you and reserve you a seat for $12. The advantage to this is that during peak times, you are sure to get a seat. My favorite bus is Baba Adventure travels to Pokhara. Sai Baba is good for Chitwan. I think $12 is cheap enough for a 5-7 hour ride, so I have it reserved. In fairness, the tourist businesses in Thamel do need to make a living so they can keep operating. They make a phone call, provide you with all the information you need and give you support, so it’s up to you if you want to pre-book or not. What is Famous in Nepal for Shopping? Nepal is famous for for its handicrafts. But be careful, they are not all created equally, and some are not even created in Nepal. Many of the tourists shops around Thamel buy things in bulk from Thailand. This could be Buddha statues, singing bowls, and any Asian looking kitch. The more authentic things are hand-knitted clothing, carved stones (you can watch the stone carvers working), and the famous Tibetan Thanka (art) that is painted by the monks at the monasteries. If you want to buy Thanka, head over to Bouddhanath, and visit one of the many monasteries in that area. Some of the art is produced by novice monks, and it will be less expensive than in Thamel. You can get almost anything here that you can get in the West; so if you want to pack light, don’t bother bringing tons of bulky things “just in case.” I would recommend a very well broken in pair of trekking shoes if you will be doing that activity (I have seen some heinous blisters on trekkers who “thought” they broke-in their shoes). Any shoes brand new, slightly new, or not sure would probably kill you. So, bring a backpack with clothes you can layer, and remember you can always have them laundered in Thamel (Kathmandu tourist district) or Pokhara (resort town which is the start point for Annapurna Circuit). Don’t bring chocolate – you can get all that here – Toblerone, Cadbury, Nestle. What about buying hygiene products in Nepal? It’s all here too. And girls, yes, you can get all sorts of feminine hygiene products in the Thamel supermarkets, so don’t “over do it” on that type of thing. If you have a favorite brand or something, then by all means, bring that. Same goes for shampoo, toothpaste, toilet paper, wet wipes, etc. Since I can’t use my electronics all the time while trekking, should I bring a bunch of books? There are several English language bookstores around, so no need to bring 4 novels. Just head straight for Thamel on your first day if you think you will need these things. Don’t buy a bunch of expensive trekking stuff; it’s all here… this is the land of Mt. Everest after all! T-shirts are perfectly acceptable for men and women. You see a lot of people with longish shorts for trekking and river activities. (The guide books all say “no shorts” but that’s just outdated information; modest, long shorts are fine.) The first time my mother came here, she had heard women have to keep their arms covered at all times. She roasted in her long sleeves for a few days before, she finally asked me, and I told her that arms are perfectly fine! You should wear the things you like, but respect the culture. The first time I came here, I brought all dowdy clothes with me, because I thought I had to look like I was wearing a sack to fit in and respect the modesty, but that’s not true. Bring things you feel good in, but don’t mind getting dirty, etc. The reality is, you may have to wear the same shirt several days in a row, so make it one you like. You are here to have fun and feel good about yourself. No one expects you to look Nepali. Represent your country and culture and be who you are. The villages are still much more modest than Kathmandu (or touristy Pokhara), so be aware that revealing clothes may be frowned upon in remote regions of Nepal. Don’t – wear a bikini/revealing bathing suit when rafting, swimming, etc. I saw a western girl run into an open shower (outside near the road) that had only men in it with her bikini on after a rafting trip one time. She was yelling “woohoo!” and splashing water on the other people, like it was a Spring Break beach party. One of the rafting guides was mortified, but did not know what to say to her. All of the villagers watched, and it was embarrassing to see a fellow Westerner make such an offensive mistake. The first clue for this girl should have been that there were no other women in the shower, and second, that even when you do see Nepali women bathing in water taps near the road, they have on a “lungee” (like a long sarong) that covers everything except for arms, shoulders, and feet. Men and women who disrespect the dress code here make a bad reputation for all of us. Nepalis don’t travel much, and many don’t have TV, so you are the only idea they have about what Western people are like. Trekking shoes, climbing shoes, sport shoes, river shoes – broken in. Clothes you can layer. T-shirts, fleece, windbreaker, shorts, lightweight pants, sport pants, gloves & hat (if it is Oct-Mar). But not a lot of clothes. A nice shirt/pants for nightlife – but not too flashy because you’ll stick out. Girls, no sun dresses, high heels or revealing clothes. Dress fun, but decent. Good camera/Go Pro – this country is a feast for the eyes, and a photographer’s dream! A sarong (for girls) and/or a light weight towel. Ladies, if you like wearing a little make-up when you go out, bring it. It is hard to find here. Most of the make-up here is really weird, cheap stuff. Just bring a couple things that make you feel happy for the party nights! If you want to buy some new clothes in Kathmandu, don’t shop in Thamel unless you like the “hippy/new age” look. 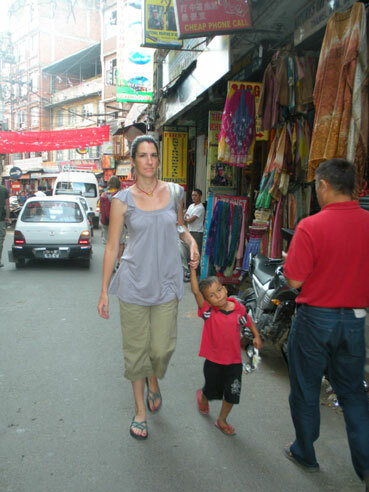 You can get Western style clothes in Durbar Marg, Asan, and Kathmandu Mall on New Road. You can get designer label clothes for literally a few dollars, custom made jeans for the equivalent of $7, and trekking clothes for MUCH cheaper than in Western countries, so don’t load your suitcase with these things. How Much do Hotels Cost in Nepal? Hotels in Nepal are cheap, and plentiful! It is easy to get a hotel in Thamel for 1500 ($15 USD) rupees per night that most travelers would think is fine. My first trip, I paid a whopping $90 for a crap hotel room, and then thought I got a bargain for the remainder of my stay at $17 per night at another place. You can even get place as cheap as 500 rupees in Thamel. Try Holy Lodge or Downtown Guest House. Your main concern will be hot water, so ask if they have hot water (tato pani chha?) and check it out before you accept the room. Also, remember, the lights will go out at some point in the evening, usually for 2-3 hours. Your hotel should provide candles for you. If you want to buy some yourself (they come in really handy) a pack of ten is about 100 rupees in any shop. If you are booking in Pokhara, same applies. You should be able to get a nice (not 5 star, or even 3, but clean and decent) room for 1000-1700 rupees per night, and there is really no need to book ahead in Pokhara, as they actually send guys out on the street to try to get you to come see there guest house and book. There are even cheaper rooms, but you may squirm a little. 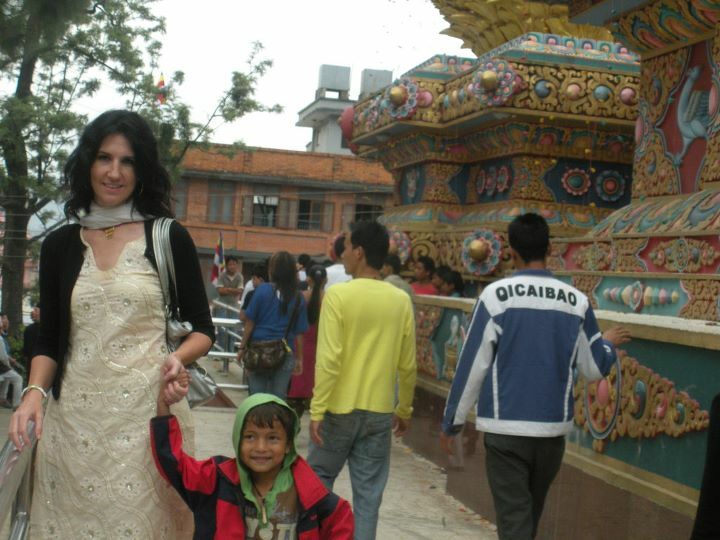 Going to Lumbini, birthplace of the Buddha? Accommodation is getting better, but you still pay a lot (for Nepal) for not so nice places. Hotels run about $12 per night (cheap ones) or more, and they are generally pretty awful. I am reluctant to recommend anything, it’s a crap shoot, “crap” being the key word here. If you are going there, just give yourself time to find a place to stay. This is a long drive from everything and not that interesting after one day, so unless you are devout Buddhist, or have some spiritual connection with the place, I don’t recommend it. I think this has to be said, because it could be a nice place to visit if they raised their standards, but unless someone tells it straight, people will just keep flocking to the place and return disappointed after a long and arduous drive. There are mothers in the tourist areas of Kathmandu who carry babies (maybe theirs, maybe not) and ask you to buy milk for their baby. They will grab your arm and implore you to buy it so they can “feed their baby.” They will walk with you into the store, show you the milk they want, usually the most expensive kind because “it is healthy for their baby,” and then thank you profusely when you buy them the milk. Then they go to a local village store in the cheaper areas of Kathmandu, and sell back the milk. They can sell at a price cheaper than wholesale because, let’s face it, they are making 100% profit!! So, they have arrangements with the shopkeepers. Get it? DON”T BUY MILK FOR THEM! Now you know the scam, if you do it, then shame on YOU! The Tourist Police are trying to rid the area of beggars. Giving to beggars just encourages begging, and it is something Nepal does not want to teach its children. JUST SAY NO – and don’t feel guilty; there is no need for it. If you see someone who you really feel is in need, 5-20 rupees is normal, what my pious mother-in-law might give. Not 1000! Not 500! Not 100! There is an initiative around the tourist areas to ask people to NOT give to beggars, it encourages the practice. Everyone has their own ideas about this, the short and simple is, follow your heart, but do not feel obligated as you are constantly approached. For many, begging is a job and the destitution is sometimes an act. There IS extreme poverty in the country, but again, beware of where and how you want to donate. I saw a guy totally get ripped off when he gave some kid 1500 rupees ($20) for a shoeshine once because that’s what the kid had told him! Yikes! A lot of people can’t do the math quickly in their heads at first (to convert rupees to dollars or other currency), so they just pay ridiculous prices. My own father almost paid 5000 ($66) rupees to a Tibetan women selling junk jewelry in Pokhara because he just assumed she was telling him the fair price; luckily my Nepali husband ran to save him before the deal was done! The women scolded my husband in Nepali saying “You are Nepali, why are you helping these tourists?” Of course he explained it was his family, and she was only a little less begrudging. But this is common in Nepal; there is an unspoken rule that you never tell the tourists the “real” price and get as much as you possibly dare to ask. So, be prepared to drive a hard bargain, and think about the exchange rate, and remember the economy. It costs the average Nepali family in Kathmandu less than $8 per day to live. It costs an individual about $3 a day to live decently. The rural (hills) families live on less than $200 per year. I would never suggest you begrudge anyone a decent, even good, living, Nepalis work hard and deserve to be paid well, but don’t get taken! We will discuss these economies a bit later. If you get up one morning, and you notice all the shops are closed and there is no traffic on the streets, you can be pretty sure that there is a “Bhanda” or strike. If you booked the tourist bus for this day, it might be cancelled. If you were planning on taking local transportation – forget it! Just stay put for the day. No taxis, cars, buses, motorbikes and anything with an engine are allowed to drive on these days. And tourist have been know to have to walk from the airport to their hotel. The Moaists (or political groups) do not target tourists, but you’re best to avoid any areas where you see large gatherings of male youths. Sometimes they burn up motorbikes, rickshaws and cars that don’t respect the Bhanda. Having said this, they always announce when they plan to do these things, and again, do not want to target tourist in anyway. But it will disturb your plans sometimes, and Chitwan is notorious for having long strikes, so just ask around and check the local paper (Kathmandu Post and Himalayan Times in English) for any planned rallies. In all likelihood you will not have too much inconvenience from the Moaist protests, and there is no reason to be afraid of what they are doing as long as you respect their right to demonstrate, like all the Nepali people do. How can you fit in while trekking or traveling in Nepal? Clothes — As mentioned, respect their dress code rules, but dress to your level of comfort. You will get lots of compliments from Nepali people if you wear a Shalwar-Kurta (traditional pants-shirt outfit for girls), but it’s not necessary. Even just wearing a shirt in the same style, covering your hips, will garner respect. Men can pretty much wear what Westerners always wear, it’s the same-same. Respect the Culture — They like when we respect their traditions and customs. Being the bossy, know-it-all Westerner will not win you any points. (This is coming from a Western woman who owns two companies in Nepal!) And even if you don’t agree with the sometimes obvious inequality between men and women, you have to remember that this feels normal for them and has been their way for centuries. So, men, NEVER touch Nepali women (i.e. the “hello” hug) especially if it is someone’s wife. And women, do not raise your voice and clearly “take charge” of Nepali men. It will be very uncomfortable for them. Yes, surely, if you hire a guide or porter, they are working for you; just treat them with respect, and remember their culture, and they will reciprocate the respect. If you are interested, check out Geerte Hofstede’s Cultural Dimension tools to compare your culture with Nepal’s. Food – When eating, ask if someone will show you how to eat with your hand. — right hand that is (a further explanation will come later). It is quite easy to do, and the best way to eat your Daal Bhaat (traditional Nepali meal served twice a day, rice & lentils sometimes with vegetable or meat curry). The first month or so I was here, I had to ask for a spoon everywhere I went, but all the Nepali people just grabbed their food and started eating. Finally, one friendly guide said, do you want me to show you how to eat with your hand? I kind of did, but didn’t because I thought it would be gross to have food all over my hand, and stick my fingers in my mouth. Anyway, I tried it and it was easy and fun! Now it is my method of choice for Daal Bhaat. If you can’t get someone to show you, just try this: with your right hand, make your four fingers into a scoop, but still kind of flat, scoop some food, hold it up to your wide open mouth, and then push the food with your thumb into you mouth. It’s quite liberating – try it! Basic Necessities like… THE SQUAT TOILET! Toilet – This is the obvious next topic. Some Westerners will understandably never be able to break the toilet paper habit and totally go native, but here’s what to expect and what to do. Did I mention there is no toilet paper? Beside the toilet, there is a bucket of water with a little pitcher hanging off the side. You are meant to fill the pitcher with water, pour it over your backside and wash yourself with your LEFT hand (never the right hand, that is the eating hand). Then you are supposed to wash your hands too. Remember to hold your hands over the toilet, and NOT the bucket. Most places will have a sink or tap with soap, somewhere nearby, so use that too to wash your hands – you can’t be too careful. If you want to use toilet paper, you need to bring it yourself and be prepared to dispose of it yourself if you are in a rural village. You can carry a plastic bag for trash, and then dispose of it at an appropriate location; ask if there is a place to burn trash. Remember, a lot of the rural villages have no plumbing or septic system, so where are you going to through all this paper? And NEVER throw feminine hygiene products in the toilets, just make yourself a durable trash bag, and get rid of the contents later. Trash is a big problem in Nepal, so if you can get used to the local way of using the toilet, then try, but if not, then just take care of your own trash. My recommendation is carry some anti-bacterial soap, and use if for this purpose. Keep your hands and nails really clean and you will not have a problem and you will actually be cleaner than the other way. Sorry, if this grosses anyone out, it is a reality that I felt I had to address. Before you get here you will read that Nepal is one of the poorest countries in the world. And that is true in Western terms. But poor is a relative term. Many tourists to Nepal are surprised to discover that the rural villages function well without a cash economy. It’s only when people begin to “want” (maybe what Westerners have) that they feel like they don’t have enough. Some Nepali filmmakers recently made a documentary about a village in Namche that was considered “backward” even for Nepal. But the people had survived for hundreds of years doing the same things, getting food in creative ways, clothing themselves, etc. When an NGO stepped in to “help” these “poor” people, they began supplying food that was not local, and passing out medicines. It only took a short time for these people to run out of food. If they did not survive the way they had been, they need not prepare for winter, grow their crops, etc. What happens when the foreign money runs out? Not only that, but one of the things in the traditional staple diet was a root that had medicinal properties to keep away disease and illnesses. The medicine supplied by the NGO was not meant to be long term, and was no longer available. These people did not know they were poor, or different, or “backward” until someone told them, and only then did they feel things needed to be different. But the NGO involved failed to see the disaster their good intentioned intervention would cause, and this community still struggles to go back to the old ways and survive. Need more information about Nepal tourism? Things are always changing here… that is normal for this region of the world! So I will try to keep you posted on the happenings in Nepal. But please feel free to email me with questions, and I’ll do my best to make your first time to Nepal the best trip you’ve ever had. If you liked this post… You might also like I Wish I Would Have Known…Nepal Part 2 – Read it here!